There is a timelessness to Svetlana Kuznetsova. Apt words from the Spaniard, who has been involved in Kuznetsova’s career since 2012, and has been her main coach since the start of last year. Kuznetsova – or ‘Sveta’ as her friends, family, and fans affectionately call her – has experienced one career rejuvenation after the other over the past 17 years on tour. She won her first Grand Slam as a teenage prodigy at the 2004 US Open then won her second five years later at the French Open. Her path has taken her to incredible highs and disappointing lows and last season, she returned to the top 10 for the first time since 2009, and qualified for the year-end Championships also for the first time in seven years. She is seeded No8 at Roland Garros this fortnight – opens against Christina McHale on Sunday on Court Suzanne Lenglen – and is considered by many of her peers as well as tennis pundits as one of the top favourites for the title. Kuznetsova has amassed a solid 20-7 win-loss record in 2017, that saw her reach the final of Indian Wells, semis of Madrid, and fourth round at the Australian Open. She is yet to find her way back to her Grand Slam-winning form of the past, but there has been an evident transformation in Kuznetsova over the last two seasons. Besides putting together more consistent results, the St. Petersburg-native has simply been happier on court. She has talked about how she’s now enjoying the journey more and more, and how putting in the work is no longer a laborious effort. “The important thing is to stay happy,” she said at the end of last season. It’s a solid motto to live by. Her coach, Martinez, seems to have played a part in this positive version of Kuznetsova. A quick glance at their Instagram feeds will give you an idea of how well they get along and how much fun they have on the court. His belief in her knows no bounds. “For me, honestly not because she’s Sveta, but for me she’s the best player, in general. She can play fast, she can go to the net, drop shot, slice… everything,” Martinez told Sport360 ahead of the French Open. “I believe that for the past three years, she’s experienced a positive change in her mentality. We talked about focusing more on quality than quantity. We don’t have to do too much. When she’s on the court, she has to give 100 per cent. If one day she is on the court for 20 minutes, that’s fine, if it’s a two-hour practice, that’s fine too, as long as it’s of high quality. 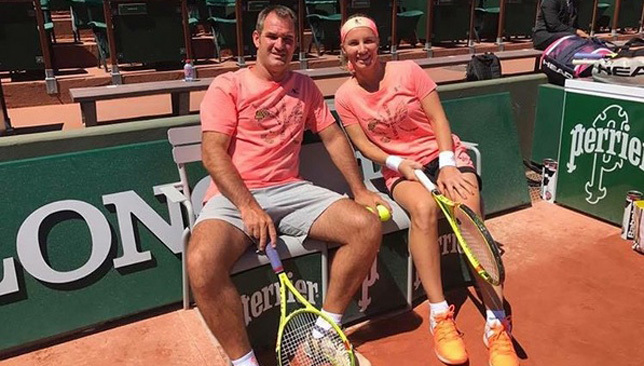 Kuznetsova first started working with Martinez at the end of 2012. She had been out of the game injured for six months and her ranking slipped to 85 in the world. A few weeks into their partnership, Kuznetsova made the quarter-finals of the 2013 Australian Open but they parted ways in May after she lost in Rome in the first round to Simona Halep. “Little by little I felt that she didn’t believe in me. We had a very good relation, but after Rome, she lost in the first round against Halep, I said ‘Sveta I feel that you have no confidence in me, I think it’s better if you find someone else because like this at the end we will break our relation, and we are good friends’. She said ‘yes, I feel with you it’s difficult to make the next step in my level’. It happens, so we stopped,” recalls Martinez. Kuznetsova went to Roland Garros alone a couple of weeks later. It was then that Martinez received a surprise message from the Russian. 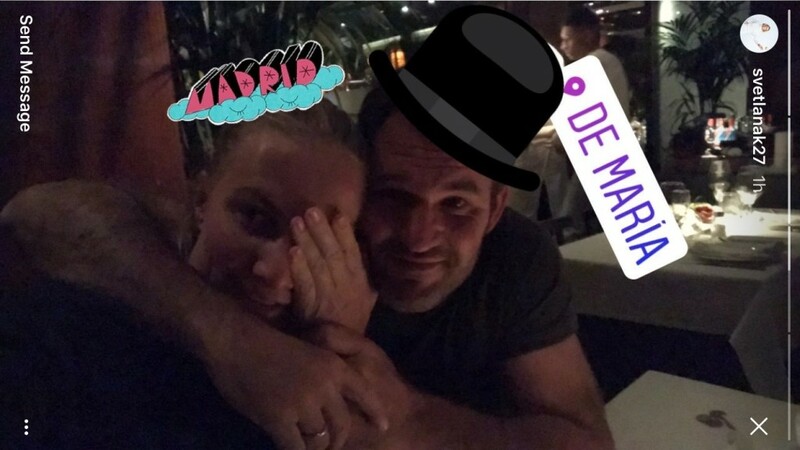 Kuznetsova then started working with Hernan Gumy, and then brought in Martinez to travel more frequently with her. By the start of 2016, Martinez became Kuznetsova’s sole coach, with Anastasia Myskina helping out briefly during the Middle East swing of Doha and Dubai in February. Martinez can trace back the change in Kuznetsova to that moment before the 2013 French Open. “I felt that something changed. She started to enjoy when she was on the court, I felt that she was running with this passion, she wanted to be better and better every day,” he says. “I never put her under pressure to win. I said ‘okay Sveta, you are doing well, the day by day has to be like this. Don’t worry because the results will come, you are a great tennis player, you don’t have to prove anything to anyone’. “She had this, not problem, but she always wanted to show the people, or her family, that she was very good and she could win. “I told her ‘Sveta you have a very long career, an unbelievable career, you have two Grand Slams, you don’t have to prove to anyone that you’re a great player. So try your best, if you win, you win, if you lose, you lose, nothing happens. But try to do your best when you’re on the court, doesn’t matter’. Having turned pro back in 2000, and having won her first major 13 years ago, you wonder how Kuznetsova still has it in her to put in the work, compete, and fight for titles. “Because she loves tennis,” was Martinez’s simple explanation. “She’s watching tennis all the time, now she’s in the stadium watching Rafa (play a match in Madrid). And when she’s at the hotel she’s watching matches, she knows all the results of all the players. “That’s something good because that means you have passion for this sport. If you have passion, and you’re enjoying it, then it doesn’t matter how old you are. “We had this conversation this week I think, she was practicing with Ana Bogdan, and Sveta didn’t know her. If this were another top player, they’d prefer to practice with someone else, or a top player. But for Sveta it’s okay, let’s play, practice, perfect. She’s very humble and it doesn’t matter who’s across the net from her. World No2 Karolina Pliskova named Kuznetsova as her top favourite to win on clay and the Czech is not alone in her opinion. But Kuznetsova refuses to get side-tracked by high expectations. In the absence of Serena Williams (pregnant), Victoria Azarenka (in the final weeks of her maternity leave), and Maria Sharapova (no wild card), the women’s draw is as open as ever and there is an opportunity for someone like Kuznetsova to achieve something big again and perhaps even return to the top five. “Of course there’s an opening,” says Martinez. “This is not a goal for us, we work day by day but we feel that now you go to Roland Garros and nobody knows who will win. And this is very good. It all starts on Sunday against McHale. PARIS — The French Open kicks off on Sunday and the women’s draw couldn’t feel more open. In the absence of Serena Williams (pregnant), Maria Sharapova (no wildcard) and Victoria Azarenka (maternity leave), and with the likes of Angelique Kerber and Garbine Muguruza struggling to find consistency and form, the list of contenders for Roland Garros this year can populate a phone book. With many players also carrying injuries, it’s tough to figure out who will make it our of the two weeks in one piece. Here’s a closer look at the women’s draw, which will see the return of Petra Kvitova, who is back from a six-month absence after she was attacked by a home invader who injured her left playing hand with a knife. The German world No1 does not hide her feelings when it comes to her relationship with clay and her record at the French Open is her worst compared to all the other Grand Slams. Her opener against Ekaterina Makarova is not the best of draws for Kerber, who also has Sam Stosur and Svetlana Kuznetsova in her quarter. An early exit would be no surprise for the struggling top seed. The Czech world No2 laughed when she was told that some people have put her as a contender for the French Open title. “I think there is nobody who would do this,” Pliskova said frankly. She’s not entirely wrong. The 2016 US Open runner-up has won just two main draw matches at Roland Garros in her career and joked before when asked to describe her relationship with clay – “It’s complicated” she said in Madrid. Her draw is not the toughest but getting through one match will be a real achievement for Pliskova – at least that’s what she says. Up until a week ago, Halep was the outright favourite for the title. But an ankle injury (small ligament tear) she sustained in the Rome final against Elina Svitolina means that her participation was up in the air up until Saturday and her movement might be restricted if she does play. Halep had a tremendous clay season this year, winning Madrid and reaching the Rome final but the Romanian continues to be struck by bad luck at the worst possible time. The curious case of Garbine Muguruza continues. The Spaniard has won just three titles in her career. One of them is the French Open. She hasn’t reached a final since last year’s Roland Garros and seems to only turn up for (some of) the Slams. She showed some good form in Rome earlier this month before retiring from her semi-final with a neck injury. Her draw is very tough and we could see her bow out early to either Schiavone or Kontaveit. Yes, I refuse to rule out the Romanian. I’m emotionally attached like that! In 14 Roland Garros appearances, Kuznetsova has made the second week 11 times. She’s reached the quarters seven times, made the semis three times and won the title in 2009. Her topspin on clay is a thing of beauty, and not many players know how to handle it, and she’s put together a solid 20-9 season so far in 2017. The Rome champion’s stats this season are just wow! A perfect 5-0 against top-five opponents in 2017, leader of the Road to Singapore standings, four titles in 2017, most match wins… the list goes on and on. Roland Garros witnessed her best Grand Slam result to date – a quarter-final showing in 2015, and she won the junior title here in 2010. She had a thigh problem during her Rome final win over Halep which should dampen our expectations of the Ukrainian but we’re sticking to our guns on this one. Feels a little odd calling Stosur a dark horse but you never really know with the 23rd-seeded Aussie. The 2010 runner-up made the semis last year (and in 2009 and 2012) and comes to Paris having reached the final in Strasbourg. She’s in that top quarter of the draw with Kerber and can easily make the last-eight if she wants to. The 21-year-old Estonian is playing just her second Roland Garros main draw but she comes to Paris with some impressive results under her belt. She beat Kerber in Rome (made the quarter-finals as a qualifier), Muguruza in Stuttgart (also made quarters as a qualifier) and earlier reached the final in Biel. She can be a tricky hurdle for Muguruza in the second round here in Paris. Last year’s semi-finalist Kiki Bertens won the title in Nurnberg on Saturday and made the semis in Rome the week before. She comes to Paris with lots of confidence and can have another solid run like 2016. Defending champs at the draw ceremony on Friday. A battle between a current and former French Open champion. The retiring Schiavone will be far from an easy opener for Muguruza. An all-lefty showdown between the world No1 and a former top-10 player. We’re sounding off the upset alert just in case. An intriguing match up between a former US Open runner-up and the reigning Olympic champion. This is going to be a grind. Set aside three hours of your day for this one. An exciting one between two of the most likeable players on tour. Barty is coming off a strong week in Strasbourg while Keys is still searching for her top form since her long injury absence earlier this season. Remember when Cepelova made the Charleston final beating Serena Williams en route? Well that was three years ago. More recently, she made the Istanbul semis on clay. Not the easiest of first rounds for an injured Halep. Ons Jabeur admits she’s feeling lucky this year as the talented Tunisian claimed a lucky loser spot for her maiden Roland Garros main draw after losing a tight three-setter to Miyu Kato earlier on Friday. Jabeur had made the Charleston third round as a lucky loser last month and she has now been given a second chance to feature in the main draw of the French Open for the first time in her career. The 22-year-old, who won the Roland Garros junior title in 2011, will open her campaign against Romanian qualifier Ana Bogdan. “It was a little bit tough today as a match, she (Kato) was playing really good – I was not really expecting that level. I tried my best, was a little bit tight at the end. I had a little bit of weakness today because my serve and my forehand – one of my best shots – didn’t help me today,” Jabeur told Sport360°. “And then I got the news that I got in and I was really, really happy. I was jumping in the physio room. So for me it was amazing. And to play in Roland Garros main draw is something unbelievable because I already have history with this tournament to be for the first time in the women’s main draw it’s like a dream. 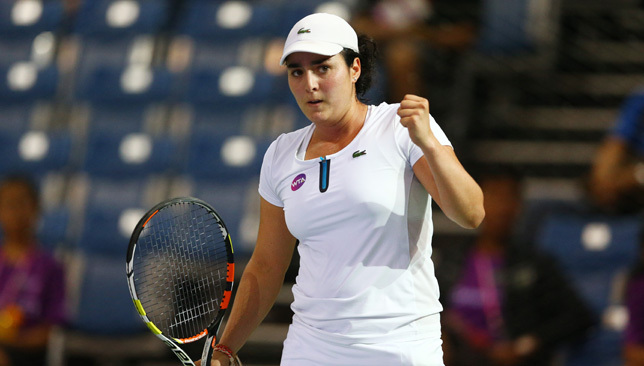 Jabeur, ranked No113 in the world, is closing in on becoming the first Arab woman to crack the top-100 since her compatriot Selima Sfar last achieved that feat in 2002. She’s hoping she can take full advantage of her lucky loser spot and claim the first Grand Slam main draw win of her career. “This is my second lucky loser this season and I did well in Charleston. Hopefully I’ll do better now. I feel a little bit lucky this year but also I missed some matches before so I think things are getting equal now. I’m going to take this chance to be better and do my best to achieve what I came here to achieve,” said Jabeur.